What Does 2017 Hold for Interest Rates? It's impossible to know for sure what interest rates will do, but here's what most experts expect and how to plan for it. With the economy finally starting to approach the Federal Reserve's growth targets, the central bank finally executed a long-anticipated rate hike in December 2016, and projected three more rate hikes in 2017. However, this is no guarantee, and the interest rates that affect consumers like you and me tend to move before the Fed acts. Here's what you need to know about what could happen with interest rates in 2017. What happened with interest rates in 2016? It depends what type of interest rates we're talking about. After widespread expectations of several Federal Reserve interest rate hikes, we got only one, and not until the end of the year. 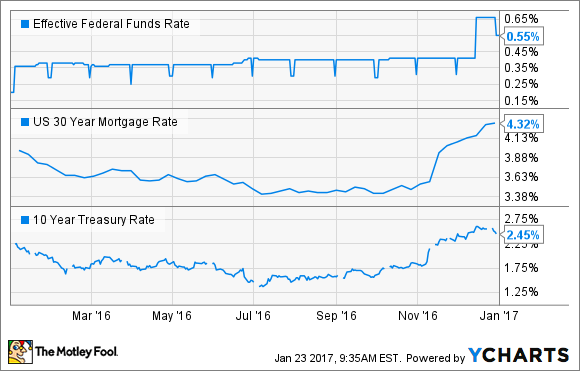 From start to finish, the federal funds rate moved from a target range of 0.25%-0.50% to 0.50%-0.75%. Effective Federal Funds Rate data by YCharts. Other interest rates actually moved quite a bit. After the election in November and the increasing expectation of Fed hikes, most of the interest rates that actually affect consumers and investors spiked higher. As you can see in the chart above, the 30-year mortgage rate rose from record lows in the 3.5% range to 4.32% at the end of the year, and the 10-year Treasury yield had a similar move. The Fed's forecast -- will it actually happen? Although the current Federal Reserve forecast calls for three rate hikes in 2017, which would translate to a total increase of 75 basis points (three-fourths of a percentage point), it's far from a certainty. In fact, in 2015, the Fed projected four rate hikes in 2016, and hiked rates only once. Experts disagree over the exact number of rate hikes we should expect. Some say that President Donald Trump's economic policies won't have their full desired growth effect until 2018 and therefore that's when the rate hikes will really get started. Others say that there's a real possibility that inflation and economic growth will get a little overheated this year, and even steeper rate hikes than predicted could be implemented. The point is that nobody knows. Having said that, the overwhelming consensus is that interest rates will be higher at the end of 2017 than they are now -- it's just a question of how much higher. What could it mean to you? To be perfectly clear, interest rates that consumers pay, such as mortgage and auto loan rates, as well as interest rates that affect investors, such as Treasury bill rates, are strongly correlated with the federal funds rate. However, it's not a perfect correlation, as we saw in the chart earlier. The rates that affect you can rise and fall in anticipation of economic growth and Fed action, not just after the Fed actually decides to change rates. Having said that, since the overwhelming consensus is that interest rates will be trending higher in 2017 and over the next few years, it is a safe bet that mortgage and auto loan rates could get higher. The National Association of Realtors is projecting an average 30-year fixed mortgage rate of 4.6% by the end of the year (currently about 4.1%), and most other projections I've seen are in the same ballpark. Therefore, if you are on the fence about buying a home, or have been considering refinancing your current mortgage, it may be a good idea to act soon before it gets more expensive. On the other hand, rising rates could be welcome news for income investors, who have been dealing with next-to-nothing returns from CDs and short-term Treasuries for some time now. For comparison, in 2014 the Federal Funds Rate was 1.35% (close to where it's expected to be by the end of 2017), and the three-month Treasury yield was 1.23% (currently 0.5%). To sum it up, if you were planning to borrow money in any form, including with a mortgage, auto loan, or credit card, you might find that the cost of borrowing will get higher as 2017 goes on. On the other hand, if you want to invest in fixed-income securities, it might be a better idea to wait.